What If There Were No Hospice? Frankly these suggestions are rearranging the deck chairs on the Titanic. Health care policy in the US is rife with micro-management of services and costs that simply rearranges the status quo. Why not rethink the whole thing? Go back to the beginning. Hospice was developed to meet a need in end-of-life care to back off from intensive interventions and to allow the dying person to approach death in a mindful and pain free manner. Was not the intent that hospice as a model for end-of-life care should become the regular and customary way any health care system helps dying people? In other words, get rid of hospice as an entity and simply make these well proved methods regular practice. All dying people would receive palliative care appropriate to their needs and their care providers would know how this was done and arrange for it. 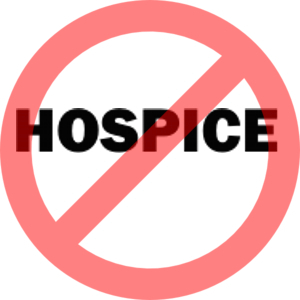 By eliminating hospice as a specialized service and by stopping specific payments for providing it, we eliminate those niche for profit businesses that exploit Medicare. Hospice becomes not a “special activity” but a routine part of a person’s life. Seems simpler somehow. What’s wrong with this idea?